Cut chicken breast into 1 inch cubes. Mix lemon juice, soy sauce, mustard, oil, and pepper. Marinate and refrigerate chicken cubes for several hours to overnight. (You may freeze this at this point, and use on a later date.) Soak wooden skewers. Preheat oven to broil. 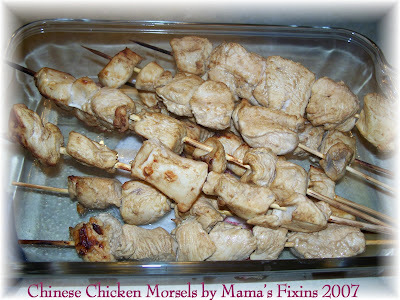 Place cubes on skewers, and place skewers about an inch apart on a broiler pan treated with non-stick cooking spray. Broil four to five inches from heat for about 7 minutes. Turn chicken, and broil another 4 minutes. Serve with cooked rice. I'm so glad that you posted this recipe, Tracy. I have that cookbook, too, but hadn't tried this recipe yet. Now I know that it worked for you, I can put it on our menu soon, too.